From approximately 1956 to 1985 my family home was in Blackley, North Manchester. During that time we had patio doors put in from the dining room leading into a conservatory where Dad was able to grow many specimen plants. One of his favourites was the Bird of Paradise (Strelitzia reginae) and whenever I see them I immediately home in on them and take photos. When Dad passed away in June 1985 Mike and I were on holiday in Madeira where the Bird of Paradise is prolific. The funeral was delayed until we could get a flight home and we purchased some Bird of Paradise flowers in Madeira to put on the coffin. 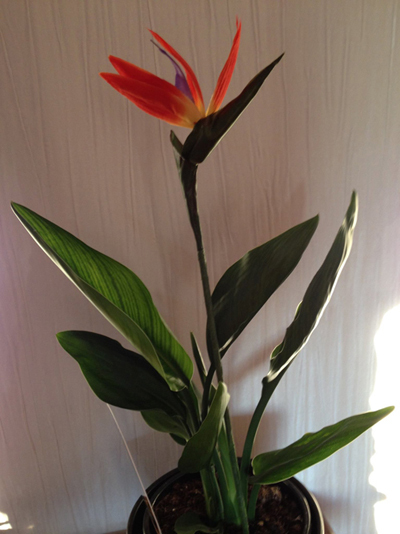 In March 2014 we were visiting Newbank Garden Centre in Radcliffe when I spotted half a dozen Strelitzia – approximately 12" high and each had a single flower on and were priced at £7.99. I was so excited that I even rang my brother to see if he wanted one. Whilst talking to him (passersby were wondering what on earth I was getting so animated about!) I suddenly realised that the flower was actually artificial and had been stuck in the pot simply to show customers what the flower would look like when it did flower! Needless to say I still bought one although I realise I may have to wait a few years for it to flower. A couple of weeks later I saw two large, mature specimens in Marple Garden Centre at £49.99 each – both with two REAL flowers on! I resisted on this occasion but decided to go back a few days later – only to find that they had been sold for Mother's Day! At the time of putting this page on the website (2nd April, 2014) I am waiting to hear back from Marple Garden Centre as to whether they can source any more!